My longest-running, most reliable knittertainment, by far, is the British soap opera EastEnders, a multi-family, working-class drama that has been running continuously since 1985. I started watching it about ten years after that, a few years before my kids were born. I know this because in early 1997, I was standing in front of the TV, rocking a sleepy newborn, when the EastEnders theme started playing. Whereupon the baby started kicking and squirming with excitement. She recognizes the song, I thought, in wonder but with a touch of alarm. If only she had been hearing as much Mozart in utero! 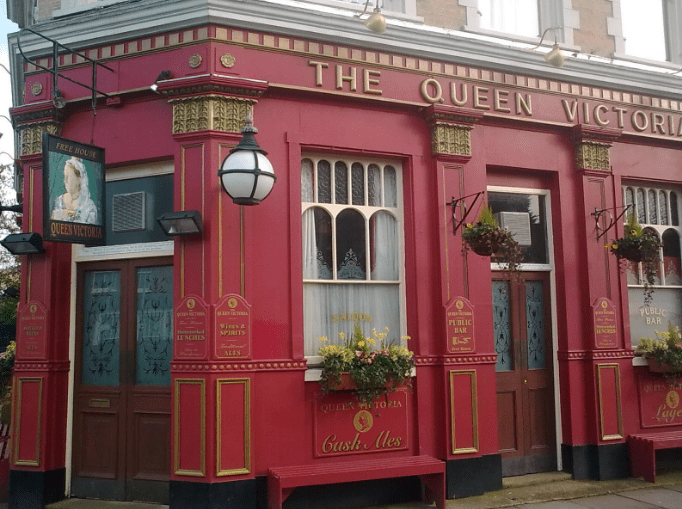 The Queen Vic, the beating heart of Albert Square. For years, I annoyed family and friends by rushing from the dinner table on Saturday nights, to closet myself for an hour for my weekly two-episode fix. In contrast to American soap operas, where a single tragic scene can seem to drag on for years, EastEnders plotlines come at you fast. You miss an episode, and an entire family can be gone from Walford the next time you tune in. 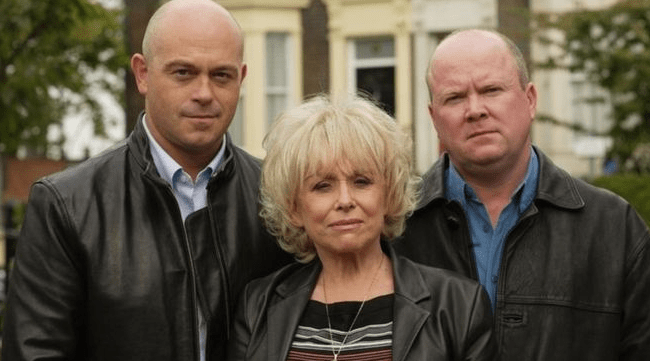 Peggy Mitchell and her sons Grant and Phil, both definitive wide boys. The advent of the digital video recorder changed all that. In recent years, I’ve stockpiled as many as 60 episodes at a time, and then binge-watched them through massive garter stitch projects, happy as a clam. At this point, I’m almost 10 years behind the current state of EastEnders. Once, on a trip to London, I made the mistake of watching a current episode. What I saw was devastating: everyone was mourning the tragic (but unexplained in that episode) death of a major character. For years, every time that character appeared, I was waiting for tragedy to strike. Which it did, but it took its time. They are standing in front of of the Queen Vic, but I have no idea who any of these characters are. It’s like time travel! To get a sense of the epic scope of EastEnders, here’s a précis of past characters, and here’s Wikipedia. If you already watch the show, be careful; I got a major spoiler from reading the Wiki. If you watch the show in the US, don’t even think about going here. Your brain cannot handle all the spoilers. TRUST ME ON THIS. To watch EastEnders in the US, google “how to watch EastEnders in the US.” There seem to be many options, paid and free. Bianca and Kat, on the market. I got a spoiler just from this picture. Be careful out there. What do I like about the show? The never-heard-in-America accents, the characters, the acting chops on display in every episode, the detailed, realistic interior and exterior sets. Dot Cotton! Pat Evans! Peggy Mitchell! They have comforted me in grief and made me laugh out loud a thousand times. I understand—at best, on a good day—70 percent of the dialogue, even when replayed. No quarter is given to the slow of understanding. You get the slang and the accents, or you don’t. The love stories are hot and heavy, and the “wrinklies” stories are hilarious, heartwarming, and occasionally hot and heavy. The writers establish a character as nasty or corrupt, and then, weeks or months later, show you an entirely believable sympathetic side. You can take nothing for granted. A friend in London once told me that the show had “too much shouting” for her. I disagree. EastEnders has just the right amount of shouting. The only thing it lacks—and it’s a big gaping hole in the fictional Borough of Walford—is a yarn shop. Wild and Woolly would be a perfect setting for all manner of hijinks and hairpulling. at one point in time, Cathy (Ian’s mother) made her living knitting sweaters. See also “Coronation Street”. Living in Detroit we could pick this up from the station in Windsor, Canada. We hung out at the Rover’s Return for many, many years.